When Eric Prydz dons his Pryda moniker, it’s almost always a momentous occasion. Today, however, marks one of his biggest landmarks yet. For the first time ever, the Swedish mastermind has released a four-track EP on his label Pryda Recordings. Be warned: This is not the Eric Prydz of “Liberate” and “Everyday,” but rather the musings of a man looking down on a historic twelve year career. Having relentlessly toured the globe the last couple of years, these tracks are finely tailored for dark rooms and thumping sound systems. You won’t find your friendly batch of uplifting progressive house here, but rather a conscious effort to mesmerize and spell-bind through subtle track progression and an engrossing, minimal aesthetic. The EP opens with the glorious “Mija,” a slow-roaster beaming with darker artifacts and a grand architecture. Showcasing some of Eric’s stranger sound design, it’s easily one of our favorite progressive house tracks we’ve heard from him to date. 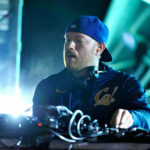 Then comes “Origin,” the most underground cut of the EP and an exposé of Prydz’s cerebral side. Though not branded with his coveted Cirez D signature, “Origin” is propelled by a formidable techno influence. “Backdraft” is equally as engaging, albeit with a deeper drum mix and and more hypnotic atmosphere. Finally comes “Axis,” the most groove-driven of the EP and the most reminiscent of Pryda’s past discography. Recalling his great work “Pjanoo,” the track feels like a modern spin on a Prydz classic. When it comes to Prydz, no release is taken lightly. Yet with this new EP, Eric has taken us all by surprise. With every track longer than 8 minutes, we dare say this is the most epic Pryda release to date (barring his album of course). Count your blessings and get to Beatport; it’s a good day to be a Pryda fan. See what else is new in the world of Pryda.